The summary of basketball news from the 10th round of matches from the Ligue Féminine de Basketball concentrates on the movers and shakers as the regular season phase is picking up in intensity as teams hustle for places in the play-off zone. K. B. Sharp once said that winning a match in Bourges was one of her best moments of playing basketball in France. It is interesting to find out what she thought of her second victory at the home of Bourges Basket as USO Mondeville ran out winners (58-53). The first quarter was turned into an individual contest between Cathy Joens (6 points) from Bourges Basket and Sharp (5 points) as the guests edged the first quarter (9-13). Bourges did get the lead back by half time (25-24) but spent most of the second half chasing after the score as they were out-hustled in the paint. While Joens with 18 points did her best offensively to keep Bourges in the game, it was not enough to stop Hhadydia Minte in her best performance of the season with 13 points and her team-mates Ingrid Tanqueray and Giedre Paugaite with 12 points each from taking the win. Bourges' difficulties at home this season are well documented and is currently not a basketball news headline. However the performance of the young guns from US0 Mondeville is very interesting as they were performing in a manner described in an interview by Touty Gandega and Minte during the Open LFB. With this victory Mondeville have moved into third place but may drop to fourth after Sunday's match between Basket Landes and Lyon BF. Challes-les-Eaux' winning streak continues after they beat Lattes Montpellier (69-65). In a tough game in which the lead changed hand 12 times the two teams were also on level terms at 9 occasions. 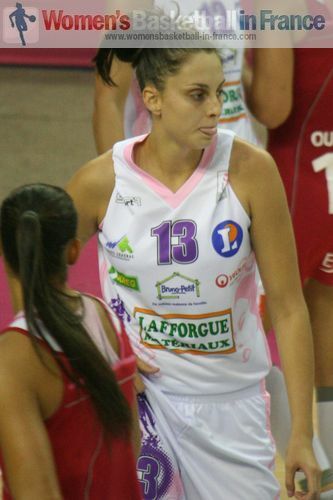 Ana Lelas was the leading scorer for Montpellier with 19 points. She went 4-of-4 from behind the arc. Two other players finished in double digits with 10 points each, Stephany Skrba and Fatimatou Sacko. Challes-les-Eaux had five players in double digits: 10 points each for Romy Bär, Danielle Page and Emilija Podrug. Mistie Mims added 14 while Anaël Lardy (left) finished with 19 points. Lardy went 9-of-10 from the charity stripes, drew 8 fouls, dished out 3 assists and made 2 steals. Challes-les-Eaux' winning streak is a club record in the LFB which leaves them as the only unbeaten team this season. Hainaut Basket's home match against Charleville-Mézières was streamed live but was not a basketball news event as the game did not live up to its expectation. Charleville did give the hosts a little scare in the final minutes as they attempted a late fightback to make it a 6-point game in the last minute. Hainaut survived to win (65-58) with Amisha Carter back in the line-up. She scored 16 points before fouling out in the closing minutes. However the player of the match was Petra Stampalija with 17 points and 14 rebounds. For Charleville-Mézière, Anne-Sophia Pagnier regained her scoring touch to share the honours with Amel Bouderra with 13 points each, while Zoi Dimitrakou had 11 points. Tarbes was involved in what turned out to be the best game of the evening against Villeneuve d'Ascq. The lead was exchanged between the teams 11 times but Tarbes were in front for 75 percent of the time. Emilie Gomis' 18 points during the first half enabled Villeneuve to go into the interval tied (39-39). For the first time this season, Tarbes were able to get both Ana Cata Chitiga (19 points, in picture) and Naura El Gargati (18 points) contributing offensively. In addition Ljubica Drljaca added 14 points while Florence Lepron dished out 14 assists. Daria Mieloszynska-Zwolak started in her last game for Tarbes in the Ligue Féminine de Basketball and added 6 points. Villeneuve d'Ascq trailed by 13 points going into the final quarter. Yet with 10 seconds to play they had the chance to make basketball news by tying the game. Unfortunately the three-ball attempt from Anne Breitreiner (13 points) rimmed out. Gomis finished the match with 27 points and 3 assists, while Olayinka Sanni compiled a double-double of 12 points and 10 rebounds before fouling out. Bruno Blier explained during a press conference the day before the match between Aix-en-Provence and Arras that Aix would win. He said that he did not need to focus on Pauline Akonga-N'Simba because they would not be able to stop her, if she was on form. However one player alone could not win a match. His words came true because Akonga-N'Simba had 22 points and 15 rebounds for Arras and no other player was in double digits. His team trailed by 4 points going into the final quarter (42-46). However with six players getting on the score sheet during the last 10 minutes, Aix-en-Provence won the match (60-57). Latvian international Liene Jansone led the way with 14 points, while Tamara Abalde fired in 13 points. Sylvie Gruszczynski and N'deye N'diaye (12 rebounds) had 11 points each. In the final game on Saturday evening Nantes-Rezé had a comfortable victory against Cavigal Nice (77-51). During the first quarter Johanne Gomis (right) from Nantes picked up 9 of her team's 10 rebounds while scoring 9 points as they raced off to a first-quarter lead (19-10). Foul problems were to slow her down for the rest of the game but she still finished with 14 points and 11 rebounds. Sarah Michel also had her best game in a long time with 16 points and 5 assists. Yet it was Lenae Williams with 21 points and Caroline Aubert' 10 points and 6 rebounds that paced the team to victory while Doriane Tahane and Regina Palusna both fouled out. Cavigal Nice were never in this game despite the efforts of Fabienne Constant with 17 points and Merike Anderson with 11 points. Once again their two former NCAA players were not on the team sheet.